Asparagus or garden asparagus, scientific name Asparagus officinalis L., is a spring vegetable, a flowering perennial plant species in the genus Asparagus. It is a type species of the genus Asparagus. It was once classified in the lily family, like its Allium cousins, onions and garlic, but the Liliaceae have been split and the onion-like plants are now in the family Amaryllidaceae and asparagus in the Asparagaceae. Asparagus officinalis is native to most of Europe, northern Africa and western Asia, and is widely cultivated as a vegetable crop. The English word "asparagus" derives from classical Latin, but the plant was once known in English as sperage, from the Medieval Latin sparagus. This term itself derives from the Greek aspharagos or asparagos, and the Greek term originates from the Persian asparag, meaning "sprout" or "shoot". Asparagus was also corrupted in some places to "sparrow grass"; indeed, the Oxford English Dictionary quotes John Walker as having written in 1791 that "Sparrow-grass is so general that asparagus has an air of stiffness and pedantry". Asparagus officinalis is widely known simply as "asparagus", and may be confused with unrelated plant species also known as "asparagus", such as Ornithogalum pyrenaicum known as "Prussian asparagus" for its edible shoots. The Sanskrit name of Asparagus is shatavari and it has been historically used in India as a part of Ayurvedic medicines. In East Asia, Asparagus officinalis is known as lùsǔn in Mandarin Chinese, louhséun in Cantonese, and lô sún in Hokkien/Taiwanese. In Thai it is known as nǭmai farang (หน่อไม้ฝรั่ง), and in Vietnamese as măng tây which literally mean "European bamboo shoots" and "Western bamboo shoots", respectively. The green asparagus is commonly used in Chinese-American cuisine and Thai cuisine. In Turkish, asparagus is known as "kuşkonmaz," literally "bird can't land," in reference to the shape of the plant. Asparagus is a herbaceous, perennial plant growing to 100-150 centimetres (39-59 in) tall, with stout stems with much-branched feathery foliage. Only young asparagus shoots are commonly eaten: once the buds start to open ("ferning out"), the shoots quickly turn woody. The root system is adventitious and the root type is fasciculated. The "leaves" are in fact needle-like cladodes (modified stems) in the axils of scale leaves; they are 6-32 mm (0.24-1.26 in) long and 1 mm (0.039 in) broad, and clustered 4-15 together, in a rose-like shape. The flowers are bell-shaped, greenish-white to yellowish, 4.5-6.5 mm (0.18-0.26 in) long, with six tepals partially fused together at the base; they are produced singly or in clusters of two or three in the junctions of the branchlets. It is usually dioecious, with male and female flowers on separate plants, but sometimes hermaphrodite flowers are found. The fruit is a small red berry 6-10 mm diameter, which is poisonous to humans. Asparagus officinalis is native to most of Europe, northern Africa and western Asia, and is widely cultivated as a vegetable crop. Asparagus is very popular in the Netherlands, Spain, France, Poland, Belgium, Germany, Austria, Italy and Switzerland, and is almost exclusively white; if not, it is specified by the local language term for "green asparagus". White asparagus is the result of applying a blanching technique while the asparagus shoots are growing. Compared to green asparagus, the locally cultivated so-called "white gold" or "edible ivory" asparagus, also referred to as "the royal vegetable", is less bitter and much more tender. Freshness is very important, and the lower ends of white asparagus must be peeled before cooking or raw consumption. Water makes up 93% of asparagus's composition. Asparagus is low in calories and is very low in sodium. It is a good source of vitamin B6, calcium, magnesium and zinc, and a very good source of dietary fibre, protein, beta-carotene, vitamin C, vitamin E, vitamin K, thiamin, riboflavin, rutin, niacin,folic acid, iron, phosphorus, potassium, copper, manganese and selenium, as well as chromium, a trace mineral that enhances the ability of insulin to transport glucose from the bloodstream into cells. The amino acidasparagine gets its name from asparagus, as the asparagus plant is relatively rich in this compound. The high alkalinity of this wonder juice is effective in reducing the acidity of the blood and helps cleanses the tissues and muscles of waste. Consume asparagus regularly for its mild laxative effect and dietary fiber that provides for regular bowel movement. Asparagus is a prime source of anti-oxidant and glutathione that can help prevent the dreaded cancer. Asparagus is a wonderfully diuretic vegetable and its efficacy is more pronounced when it is taken in juice form. Drink a small amount of asparagus juice mixed with raw honey three times a day daily to strengthen a weak or enlarged heart. The diuretic and alkaline properties of asparagus help prevent or dissolve kidney stones. It helps break up oxalic acid crystals formed in the kidney. The high content of folate, calcium and other minerals in asparagus are important in reducing the risk of birth defects and low birth weight. The diuretic effect of the juice is also a big help in reducing water retention in pregnant women. Asparagus is a commonly used vegetable in culinary world. Young shoots of this greenish vegetable are quite popular in making various asparagus recipes. As soon as the shoots start growing, the woody smell and strong flavor of the plant makes them unsuitable for consumption. The typical way of making asparagus dishes is to boil them and serve as an appetizer with any kind of dipping or sauce. Vegetarian side dishes also make good use of asparagus. Stir-fried asparagus dishes are very commonly served in Asian cuisine. Some of the other ingredients that compliment the asparagus dishes are chicken, beef as well as shrimps. Even bacon wrapped asparagus dishes are widely served as an appetizer in several Asian restaurants. Asparagus vinaigrette also makes a delicious side dish to various grilled meat and poultry dishes. As a healthy vegetable, asparagus has varied uses in making soups and stews. According to early evidences from the culinary world, asparagus was fondly eaten as a raw vegetable and still the same trend is being followed by adding it as a raw ingredient in several salad dishes. ‘Pickled’ asparagus is also a delicacy in various cuisines and served as a side dish. Due to the presence of dust and sand on the roots of the asparagus, it is strongly recommended to wash it thoroughly before adding it to asparagus dishes. 1- This basic Roasted Asparagus recipe from Ina Garten is a good place to start your asparagus adventures. 2- Spaghetti With Asparagus, Smoked Mozzarella and Prosciutto from Giada De Laurentiis is luscious and rich but takes only a few minutes to prepare. 3- White asparagus is grown under soil to prevent photosynthesis from turning the stalks green. Just remember to peel the stalks before you cook them. Try it in Emeril’s Fried Soft Shell Crab, White Asparagus and Wild Sorrel With a Grilled Ramp Dressing. 4- Creamy Farfalle With Cremini, Asparagus and Walnuts from Giada is a creamy crowd-pleaser. 5- Wrap asparagus in almost anything. Rachael Ray wraps it in bacon, Giada wraps it with prosciutto and smoked salmon (pictured at top), Ellie Krieger wraps it in smoked turkey and Paula Deen wraps it in phyllo dough. 6- Asparagus and Zucchini Crudiis a bright and fresh appetizer, ready in minutes. 7- Emeril Lagasse’s Asparagus Soup hits all the right spots on those not-quite-summer evenings. 8- Alton Brown’s Wild Mushroom and Asparagus Risotto will get you in the spring state of mind. 9- Everyone’s invited to brunch at your place with Tyler Florence’s Deep-Dish Ham Quiche With Herb and Asparagus Salad. 10- Rachael kicks up your weeknight meals in less than 30 minutes with Vicki’s Favorite Chicken With Grapes, Couscous and Roasted Asparagus. 11- Giada’s Grilled Asparagus and Melon Salad is a light and refreshing summer treat. 12- Replace calorie-heavy Chinese takeout with this lighter Sesame Shrimp and Asparagus Stir-Fry. 13- Mario Batali’s Mushroom, Asparagus and Potato Cake is perfect comfort food for a rainy day. 14- Nadia G. heats up her Spicy Sauteed Asparagusside dish with some tamari and chile flakes. 15- Food Network Magazine utilizes store-bought rotisserie chicken for Chicken and Asparagus Crepes. 16- Michael Symon’s Tempura Asparagus is a great addition to any meal. 17- Turn your asparagus into a pesto, then pull a Bobby Flay and throw it all on the grill with Grilled Flatbread With Asparagus Pesto and Fontina. 18- Make it a meal with Rachael’s Grilled Mahi Mahi Fillets and Asparagus With Orange and Sesame. 19- Just crazy enough to be delicious: Iron Chef Jose Garces brings asparagus to the sweet side with Asparagus Ice Cream. 20- Everything tastes better in cupcake form, including Giada’s Baked Macaroni and Cheese Cupcakes. 21- Paula takes her asparagus on the go with her Lady and Sons Asparagus Sandwich. 22- Break out the grill on your next Meatless Monday. Aida Mollenkamp utilizes tons of fresh veggies like portobellos and asparagus for The Girl Burger. 23- Make-ahead meals are the key to picnic season. Make Rachael’s Asparagus Pasta Salad the night before for a stress-free picnic. 24- Food Network Magazine’s Asparagus and Cheese Tart uses frozen puff pastry dough for a quick, stylish dish. 25- Surprise your special someone on date night with Bobby Flay’s Crispy Salmon With Green Herb-Caper Sauce With Asparagus Cheese Puffs. Asparagus officinalis has a long history of use as a medicinal plant. Dioscorides, a first century Greek physician, recommended extracts of asparagus root for treatment of urinary and kidney problems, jaundice and sciatica. 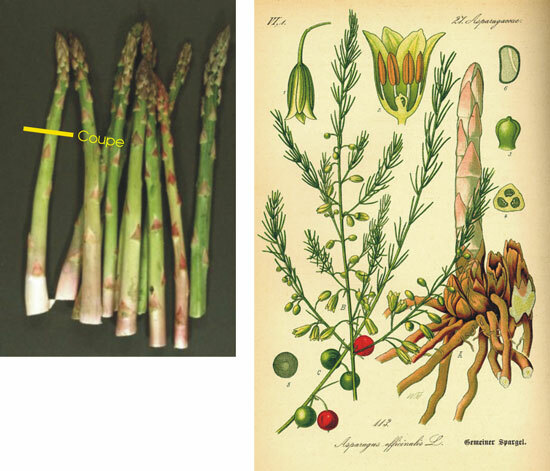 Asparagus officinalis was later mentioned in Gerard’s Herbal and was thought to ‘cleanse without manifest heat and dryness’ and ‘increase seed and stir up lust’. Today, it is known to be a strong diuretic and is used in the treatment of urinary problems such as cystitis. It is also useful in the treatment of rheumatic conditions, is a mild laxative and sedative, and is considered useful in the treatment of a range of maladies from arthrosis to tuberculosis. Asparagus is also a rich source of glutathione, a powerful antioxidant that is known to boost the immune system, reduce inflammation and maintain the health of the liver. China is the world's largest producer: in 2012 (7,350,000 tonnes), at a large distance followed by Peru (376,645 tonnes), and Mexico (119,789 tonnes). U.S. production was concentrated in California, Michigan and Washington. The annual production for white asparagus in Germany is 57,000 tonnes (61% of consumer demand). The top asparagus importers (2011) were the United States (174,609 tonnes), followed by the European Union (external trade) (94,292 tonnes), and Canada (23,265 tonnes).